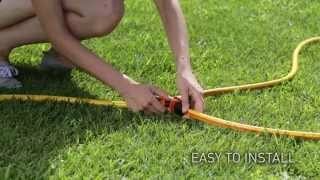 Connects three hoses with a "click" and transforms a single irrigation line into a double line. Tool-free installation, simply apply three automatic couplings to the ends of the hoses and insert the connecting element. Ensures a stable, leak-free connection. For deviating and splitting up water lines. Pieces per pallet: 5120 pcs.